Since 1832, it has been our business to manufacture the finest colour that money can buy. Early in the nineteenth century, the reliability of artists’ colours was inconsistent and questionable. Until Winsor & Newton. The company was founded in a small shop at 38 Rathbone Place in London. Henry Newton was a dedicated painter, while William Winsor brought exceptional scientific knowledge to the partnership, knowledge that had been missing from the artists’ colourmen trade. To this day, that dedication to the marriage of superior chemistry with artistic experience remains a hallmark for Winsor & Newton. Today, Winsor & Newton has more expertise with artists’ materials than any other manufacturer in the world. Many of our employees are hired for their experience as artists as well as for their superior technical expertise. That modest partnership launched almost two centuries ago became the foundation for the world’s most recognized name in artists’ materials. Making any artists’ colour requires astonishing skill. You don’t simply add pigment to linseed oil and mix up a batch. Making truly fine colour requires extensive understanding of the different pigments, the drying oils and how the almost infinite number of variables affect the final product. Every pigment absorbs oil differently, requiring careful and individual milling processes to provide the artist with colour that offers optimal tinting strength, that remains in stable suspension in the tube, and that forms the most permanent paint film possible. There’s no substitute for the years, the decades, and the generations that are needed to understand colour. Winsor & Newton holds the collective experience and expertise to formulate each and every colour in exactly the way it will best serve artists. There are qualities – such as brilliance of colour, or ease and consistency of application — that make a dramatic difference to the artists’ success. And we know, through almost two centuries of experience, that our products do exactly that. But making a great product isn’t enough. In this rapidly changing culture, we also know that great information and world-class technical support are just as important as the quality of our colour. That’s what this book is for: to provide you with direct, accessible information about how to make best use of the colour, ensuring that your carefully created image is held within a paint film that, under the right conditions, can last for many generations. We know that the quality of our materials will show up in the quality of your finished art. History. Oil colours have been used in various forms since the fourteenth century. Before then, pigment ground into an emulsion with egg was the medium of choice in most artists’ studios. Oil colour, however, quickly surpassed egg tempera in popularity because of greater versatility, longer working time and more subtle rendering. The rounded, exquisitely modelled forms characteristic of the Renaissance would not have been possible without the qualities that come with oil colour. 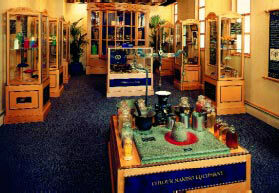 The Winsor & Newton Colour Museum in Wealdstone, England includes pigments and materials used in the manufacture of fine colour. Some of the materials are unique and date back thousands of years. Originally, the master painter’s apprentices within the studio prepared oil colours. During the late eighteenth century, colourmens’ shops appeared in Europe, offering colour that was pre-milled. 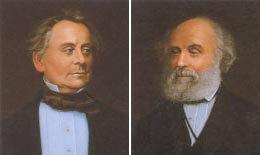 In 1832, Winsor & Newton was founded in London. While there is great romance in the history of oil colour, there is also no question that today’s colours are vastly superior in quality to those made centuries, generations, and even just a few decades, ago. Why? New, more permanent materials, superior methods, as well as the accumulated experience and scientific expertise of the manufacturer have made a dramatic difference in the quality of colour available to today’s artist. Components. Today, traditional oil colour is made through essentially the same process employed in the fifteenth century. Pigment is milled with a vehicle of linseed oil (from the flax plant) and, in some cases, safflower oil (which is paler and dries more slowly). Instead of grinding each colour by hand, using a stone or glass muller, the best quality colour is produced today using a variety of milling methods. Decisions about how many passes are required through the triple roll mill, how much oil is used, as well as the kind of oil, are all determined based upon the individual characteristics of each pigment. < Vehicles and oils of the finest quality will remain stable in the tube for decades, and stable on the surface for generations. Above is a selection of mediums and oils dating back to the 1880’s on display in the Winsor & Newton museum in Wealdstone, England. Depth of colour. When milled properly, linseed oil will support a high concentration of pigment. This translates into high tinting strength, true mixing, and the opportunity to take full advantage of the relative transparency or opacity of each pigment. In addition, the refractive qualities of the oil (how light passes through the vehicle) bring a richness and jewel-like depth to the colour that is still unmatched when compared to any other medium. Extended working time. Depending upon the pigment, Winsor & Newton oils become touch dry in 2-12 days, allowing for extended working, blending, and modelling. The variance in drying time is due to the reaction of each pigment when mixed with the oil. Stability within the tube. Expertly milled colour will remain in stable suspension almost indefinitely. Colours milled with less skill have a tendency to separate, with oil rising to the top of the tube, and leaving bulk pigment at the bottom. In addition to being an annoyance for the painter, too much separation can result in colour that, when applied, is “underbound,” and that doesn’t include enough oil to create a stable paint film. Permanence and stability on the painted surface. The finest oil colour is an ideal mixture of pigment and vehicle, allowing for the oil to dry as it should, forming a stable film that, under the right conditions, will last for many generations. < Artists’ Oil Colours are formulated and milled to the most exacting specifications, allowing artists to take full advantage of the unique characteristics of each individual pigment. Winton Oil Colours are formulated and milled to offer dependable working properties at an economical price. Take care to avoid adding too much solvent to your colour mix. Excessive solvent spreads the chemical structure too thin, preventing the linkages and the formation of the structural film. Always use pure, artists’ grade solvents. Hardware/DIY grade solvents, or any solvent that hasn’t been refined to the degree achieved with artists’ grade solvents, often contain impurities that will interfere with the structural film formation. Don’t use old, or oxidized turpentine. To keep turpentine fresh and usable, always store in full bottles and in the dark. Oxidized turpentine leaves a gummy residue that can prevent the colour from drying. Observe the rules of “fat over lean,” and “thick over thin.” (See the techniques section on page 75). These techniques ensure that successive layers of colour are increasingly flexible, and are less prone to cracking. Following the introduction and subsequent popularity of acrylic colours, which dry in 10-20 minutes, oil painters began requesting a product which dried faster than traditional oils. Winsor & Newton responded in 1976 by developing a range of alkyd colours, which has today become Griffin Alkyd Fast Drying Oil Colour. Alkyds are made from a naturally derived vegetable oil (most of the alkyd oils used in the art materials industry are soy-based). The oil is polymerized through a chemical reaction with an alcohol and an acid, (“Polymer” means that the molecules link up into long chains.) It’s like coupling a long train. The polymerized result is a resin-like product that - when mixed with a suitable, low-aromatic solvent - takes on many of the properties of traditional linseed oil. Just like traditional oils, alkyds dry by oxidation (a linkage achieved with the help of oxygen in the atmosphere), a process that happens much more rapidly for alkyds than for traditional oils. The film is touch dry in 18 to 24 hours. The Griffin range includes 50 colours (51, USA), all of which are rated AA or A as permanent for artists’ use. The colours remain workable for 4 to 8 hours, and are touch dry in 18 to 24. Faster drying means that the traditional oil techniques of both impasto and glazing can be done in considerably less time than when working in traditional oils. The colours are ideal for working outdoors. Consistent drying times across the range removes the usual restrictions that come with conventional oils, making it easier to overpaint, regardless of the colour upon the surface. Because alkyd resin has physical properties that differ somewhat from those of traditional oils, the pigment load is somewhat different, as well. Experienced painters will notice slightly greater transparency compared to the Winsor & Newton Artists’ Oil Colour range. Just remember that pigments vary in their transparency by nature, and Griffin colours are marked as “transparent or semi-transparent,” or “opaque or semi-opaque” on the colour chart. The level of transparency of a colour is relative to other colours. And greater transparency means increased depth and clarity for glazes. Permanence and stability of alkyd. As a paint vehicle, alkyds create a paint film that is comparable in stability to that of traditional oils. In fact, Dr. Marion Mecklenburg, Senior Research Scientist with the Smithsonian Institution in Washington DC, has been researching the stability of oil films since 1978, attempting to identify the factors that contribute to the most secure paint film possible. Winsor & Newton Alkyd Oil Colours have shown extraordinary stability and stretchability. With few exceptions, tests on twenty-year old Winsor & Newton alkyds show the paint film remaining stretchable up to 10% before breaking. That’s amazing, considering that traditional oil colours of the same age exhibit stretchability of only 1-2%. In addition to their superb working characteristics, their superior qualities as a colour for underpainting and for glazing,Winsor & Newton alkyds are proving to be remarkably stable and durable. Water mixable oil colour. Contrary to the old phrase that “oil and water don’t mix,” linseed oil can indeed be made to accept water as a solvent. The resulting mix is called an “emulsion,” a balanced mixture of substances that don’t normally combine. And it’s been done for thousands of years with egg and water, wax and water, and, yes, oil and water. The mixture can be accomplished through mechanical means or by a chemical modification. Artisan Water Mixable Oil Colours are formulated with linseed and safflower oils that have been modified to accept water as a solvent. Artisan works and dries like traditional oil colour without the use of turpentine or white spirit. Winsor & Newton Artisan Water Mixable Oil Colour is a genuine oil colour made from modified linseed oil and modified safflower oil. A range of unique mediums have been formulated to allow the artist to achieve all the traditional oil colour techniques, without requiring turpentine or white spirits (mineral spirits). The most successful water mixable oil creates the emulsion immediately upon adding water. This self-generating emulsion, used in the formulation of Artisan, yields the most traditional type of paint consistency and workability. The only chemical modification to the linseed oil vehicle is in preparing it to accept water as a solvent rather than spirits. The working characteristics haven’t been compromised, and are like those of traditional oil colours. Solid stick oil colour. In the early 1980’s, Oilbar was created by two American artists, who wanted the characteristics of oil colour in combination with the immediacy of pastels. Following the demand and success of Oilbar in America, Winsor & Newton launched Artists’ Oilbar to the worldwide market in 1992. 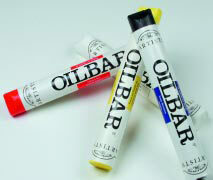 Oilbar is simply oil colour in stick/solid form. The artists’ range of 35 colours is made through a combination of pigment and linseed oil or safflower oil with a blend of specially selected waxes. And the range includes a Colourless Blending Bar for a variety of painterly effects. Formulated with the ideal balance of pigment and vehicle. Because the finest pigments are used, and there is greater concentration of those pigments within the vehicle, this often translates into higher cost for artists’ colours. Formulated to offer the best possible tinting, mixing, and covering characteristics. Artists’ colours are formulated to take full advantage of the unique characteristics that come with each individual pigment. Offered in a wider range of colours. Every colour included in Winsor & Newton artists’ quality ranges (e.g., Artists’ Oil Colours) has been selected based upon the criteria of permanence, its place within a broad, well-balanced total spectrum, relative opacity, and handling properties. While colour made for students or beginners may not offer the standards that come with Artists’ colours, there are qualities that are essential for an introductory range to fully meet the needs of a new artist. Dependable quality at a lower cost. The student range from Winsor & Newton (Winton Oil Colours) is lower in cost because it has been made from moderately priced pigments. Just because they cost less doesn’t mean that they’re not milled and dispersed with great attention to quality and performance. In fact, Winton is, in many respects, superior to the artist-grade products of some other manufacturers. The ideal limited spectrum and clean colour mixing. All Winsor & Newton student ranges are ideal for the artist learning the fundamentals. The student ranges have been made from pigments which offer as broad a palette as possible and that specifically relate to the Winsor & Newton artists’ ranges. This provides clean colour mixing and helps artists to upgrade to the superior range of artists’ colours when ready. It’s worth remembering that the oil vehicle used in milling both student grade and artists’ grade colours is essentially the same, and the colours can be safely intermixed. A word about pigment strength. There’s a common misconception that pigment strength is the only benchmark for making good colour. But that’s too simple. High pigment strength is important, but too much pigment can make the colour unworkable. For example, packing a tube full of phthalocyanine pigment would make a colour with far too much tinting strength, overpowering any colour with which it’s mixed. On the other hand, some pigments are naturally weak in tinting strength. The formulation of our Terre Verte, for example, offers superior pigment load, (or concentration within the tube), yet because of the physical structure of the pigment, the colour is weak in tinting strength. Colour ranges which boast of “nothing but pigment and oil” can be difficult to work with; stringy, sticky, lacking in brilliance, and are often unstable. Each of these characteristics makes it more difficult to construct a sound paint film. Although Winsor & Newton Artists’ Oil Colours are essentially “pigment and oil,” it is the type and quality of each, the formulation and limited use of the correct additives, the machinery used, and the people with a lifetime of experience who can ensure that each pigment is developed into a stable, permanent colour. Winsor & Newton balances all the features - including pigment strength - needed to make colours that allow maximum artistic freedom and superb control. And, after taking into account all the variables, Winsor & Newton colours generally show the highest pigment strength. Single pigment colours. As a governing principle, single pigments are used wherever possible in Winsor & Newton ranges. The quality of colours made from a single pigment is dramatically better than those made from mixed or multiple pigments. Combined with strength of colour, single pigments provide a wide colour range and offer cleaner, brighter mixtures with an infinite range of hues. This is particularly important for greens, violets, and oranges. Use of single pigments in formulating these secondary colours considerably broadens the artists’ available spectrum. A total of 95 different pigments are used to produce the range of 114 Artists’ Oil Colours. “Hue” replacement colours. The biggest contributor to the price of the finest artists’ colours is the expense of the pigment. Cadmiums, cobalts and cerulean, for example, are expensive colours to produce. And for the artist requiring the characteristics that only these pigments can offer, nothing else will do. But for the artist who requires colours that mix cleanly and consistently, who needs a comprehensive (but not necessarily exhaustive) spectrum, and who desires dependable quality, a student range (such as Winton Oil Colours) may be the best solution. “Hue” colours have been formulated with alternative pigments in an effort to approximate the original colour at a lower cost. Because every pigment is unique, they will perform differently than the original colour, offering working characteristics that some artists may, in fact, prefer for specific applications. The Winsor & Newton student ranges include colours labelled as “hues” (for example: Cadmium Red Hue, Cerulean Blue Hue, and Cobalt Blue Hue). These are colours that have been made from an alternative pigment to approximate the original colour at a lower cost; the real difference is in how they perform. When comparing the genuine Cadmium Red with its Hue counterpart, you’ll see that they’re both a bright red. Both are very permanent but the cadmium is opaque while the hue is transparent. The Hue shouldn’t be dismissed as lower quality. Because of its natural transparency and mixing characteristics, some artists may prefer the hue colour! In artists’ ranges the word “hue” is used to indicate where an alternative pigment has been used to replace an original pigment that, for whatever reason, is no longer available. Transparency vs. opacity. The physical structure of pigment determines whether or not it will be opaque, semi-opaque, or transparent. For example, when viewed through a microscope, pure phthalocyanine pigments appear translucent, as if made from stained glass. This characteristic transparency makes the colour well-suited for glazing techniques and clean colour mixing. Conversely, a cadmium pigment is quite dense and opaque, allowing the transmission of little or no light. Naturally opaque colours are best suited for applications requiring maximum covering power. With experience, the painter can learn to take advantage of the relative natural opacity or transparency of fine colours, exploiting those qualities to achieve an almost unlimited range of hues, and the cleanest, brightest mixtures possible. Every Winsor & Newton colour is rated for transparency on the colour chart. Series numbers. The relative price of each colour is indicated by the series number upon the tube or within the range literature. Each series is determined mainly by the cost of the pigment, with Series 1 being the least expensive and Series 6 the most costly. Series numbers do not indicate the quality of the colour, only the relative cost of the pigment and production. Depending upon how the painter is working, a Series 1 colour may be the best possible choice. As the world’s largest manufacturer of premium quality artists’ materials, Winsor & Newton bring as much care and attention to the labelling and safe use of products as to the quality of their performance. Winsor & Newton products should not present a risk to health if handled appropriately, as detailed upon the product labels and within our literature. Prolonged contact with the skin and ingestion (or swallowing) of the product should be avoided. This includes avoiding practices such as applying colour with the fingers or pointing brushes in the mouth. EU legislation. These regulations were introduced in the 1960’s. They cover all products available to industry or the general public in the EU. The basis of the system is the classification of dangerous substances into one of the following classifications: TOXIC, HARMFUL, CORROSIVE, IRRITANT, OXIDISING, EXPLOSIVE, FLAMMABLE or DANGEROUS FOR THE ENVIRONMENT. There can be various levels within a classification, for example, Very Toxic or Extremely Flammable. Most levels of classification have accompanying symbols, for example, skull & cross bones for Toxic. In addition, these classifications can be accompanied by “Risk Phrases” and/or “Safety Phrases”. Any artists' material, which falls into one of the above classifications, must be labelled accordingly. The three most common classifications in artists' materials are Harmful, Flammable, and Dangerous for the Environment. The seals for each are shown below. Avoid release into the environment. Refer to safety data sheets. Health Labelling for the USA. “AP,” indicating that the product has been tested by an independent toxicologist and is considered to be non-toxic. The labelling system came about through the combined efforts of a number of associations and groups. The American Society for Testing and Materials (ASTM) has prepared standards for the safe use of artists’ materials. These have been published in a booklet entitled, “ASTM Standards for the Performance, Quality, and Health Labelling of Artists’ Paints and Related Materials” (ISBN 0-8031-1838-4). The labelling standard for Chronic Health Hazards in Art materials (ASTM D-4236) was codified into US law as part of the Federal Hazardous Substances Act. The Art & Creative Materials Institute (ACMI) provides labelling certification, and works to promote the safe and informed use of art materials in North America. Beginning in 2000, many art materials sold in the United States will include additional labelling for products containing cadmium and lead as a result of action surrounding California’s Safe Drinking Water and Toxic Enforcement Act of 1986 (commonly known as Proposition 65). The new labels will reflect requirements resulting from Proposition 65, independent of labelling required by the Federal Hazardous Substances Act. NOTE: There is no direct relationship between the EU and USA systems of health labelling as the categories used have different levels and limits, eg., Flammable in the USA is not automatically considered as Flammable in the EU. USA ONLY labels may appear on products in the EU as Winsor & Newton products are sold internationally. However, artists in the EU are advised to follow EU labelling. Good working practice should be adopted with all artists’ materials, whether potentially hazardous or not. Before you start, read the product labels. Ensure plenty of fresh air, ventilation and circulation. Do not sleep in your studio without first removing painting materials elsewhere and in particular, be sure to dispose of unused solvents and dirty rags in fireproof and solvent-proof containers. Store all materials, particularly solvents, tightly capped when not in use. Do not expose artists’ materials to naked flames or excessive heat sources. Do not eat, drink or smoke when working due to the risk of ingestion (swallowing). Avoid excessive skin contact, particularly with solvents. Do not point your brushes in your mouth; paints are not made for human consumption. Refrain from applying colour directly with your fingers. Use a barrier cream, like Winsor & Newton Artguard or surgical gloves when painting with your hands. When airbrushing, wear an approved mask and work in adequate ventilation to avoid inhalation of airborne particles. An exterior vented extraction system is recommended. When using powdered pigment, wear an approved mask and work in adequate ventilation to avoid inhalation of airborne particles. Anexterior vented extraction system is recommended. Do not pour out more solvent than is necessary for your current painting session, it will only evaporate into the room. If paint or solvent is splashed into the eyes or on the skin, wash thoroughly with water. Avoid prolonged inhalation of solvent vapours. Keep artists’ materials out of reach of children, animals and foodstuffs. Clear away all solvent and paint soaked rags and discarded palettes. Dispose of them in an airtight, solvent-proof container or in an appropriate manner. Wash hands thoroughly at the end of your painting session. Do not use excess solvent to wash colour from your hands. Use a hand cleanser, like Winsor & Newton Artgel. There’s real pleasure to be had in packing a portable colour kit, and painting under an open sky or during holiday travel. Any of our oil colour products are suitable for outdoor use. Of all our ranges, however, the fastest drying and therefore the easiest to work and re-work over the course of a single painting session, is Griffin Alkyd Fast Drying Oil Colour. Because of safety regulations with the airlines, we offer the following information regarding our colour products. Any product or material with a flash point below 61° Celsius is classified as dangerous goods, and those products cannot be included during airline travel. (NOTE: the flash point is the temperature at which a product will flame, therefore a higher flash point is better.) While a few of our products do have a flash point at or below the 61° mark, the flash points of a large number of our oil colour products are well above. Below is a comprehensive list that can be used (and shown to an airline official, if needed) to verify whether or not a product may be considered allowable for airline transport. Colour code Each colour is given a code number that is uniform across all ranges. For example, Cadmium Red has the colour code 094 within each range in which the colour is offered. Product code For ease of reference and cataloging, every Winsor & Newton colour product is labelled with a unique product number Pigment content The chemical description of the pigment. 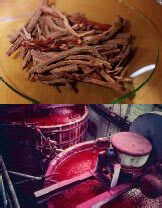 For example: cadmium sulphoselenide is the pigment for Cadmium Red. Series Number Each series is determined mainly by the cost of the pigment, with Series 1 being the least expensive and Series 6 the most costly. Volume The volume quantity is in ml and US fl. oz. Every Winsor & Newton oil colour is formulated to meet exacting standards, from viscosity to tinting strength to permanence and stability. Only the best pigment available is used. Each pigment is selected based upon standards of permanence and true pigment character. Each delivery of every pigment is tested, and we might reject up to 25% of all incoming pigments as being unsuitable for our products. Only the best vehicle is employed. The oils used in our ranges are proven to be the most stable available. A well-balanced spectrum, ensuring that the artist has the widest array of mixing options possible. Single pigments, wherever possible. 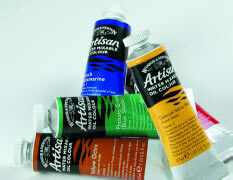 The use of single pigments provides the widest colour range and offers cleaner, brighter mixtures. Expert milling. Each colour is milled to achieve the most stable suspension within the tube and to ensure, with proper application, the most permanent film possible. 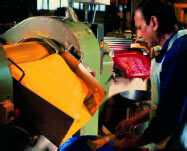 In addition, the colours are milled to maximize working characteristics.